Just before 6 o'clock in the morning I catch the first bus to the center of Asmara. In a small grocery store I buy some fruit juice and biscuits as a breakfast. The bus to Massawa leaves at 7 o'clock. I will get out at Ghinda, 45 kilometers from Asmara. 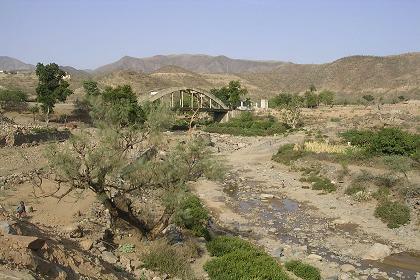 The Asmara-Massawa road will be the first road in Eritrea where users have to pay a 'Road Users Charge', as a means of cost recovery for infrastructure maintenance. I ask the driver to stop just before the bus passes the bridge, so I can enjoy some of the landscape as well. Children are giving me directions. "Where are you going? they ask. "To Ghinda" is my answer. Thinking I am lost they point at the bridge. When I enter the town, I take a side-way uphill, leaving the main road. Children are following me, men ask if I am ok. Guess this is an unusual route for a tourist. Again they ask "Where are you going?" I point my finger to the top of the hill. No further questions. Just curious kids. After half an hour I think it is time for a tea break. When I pass a house, and wonder if it is a bar or not, I am invited to come in. I drink tea with and start a simple conversation with the women and the children. I have another tea and want to give them 10 Nakfa. Asmeret tells me it is to much. I have to drink some coffee as well. Although it does not fit into my diet, I cannot refuse. I drink three cups of coffee and ask if I can take some pictures, so I will remember them when I am back home. I have to send them a copy as well. We exchange addresses and I continue my walk uphill. The path to the mosque is very steep and tiresome, but seen from above, there is a good overview of Ghinda, so one will have a better idea for further walks. I visit the compound of a school and the local market at the bus station. From there I have a ride with a donkey cart to the railway station. Back at the bus station there is some confusion. I have to buy a ticket and wait for the next bus. To many passengers. The procedure is not clear to me. They must have read my desperate mind. "Get in!" one of the men orders me, and points to one of the last empty seats. Without any further delay I return to Asmara, where I have some Asmara beers in Bar Selas and a number 10 pizza in Terhas' Pizzeria Eritrea. Apart from the fact that Terhas' pizzeria serves good pizza's (starting from 18:00!) for a nice price, she is well aware of the nature of my trip to Eritrea and therefore a good source of tourist information. 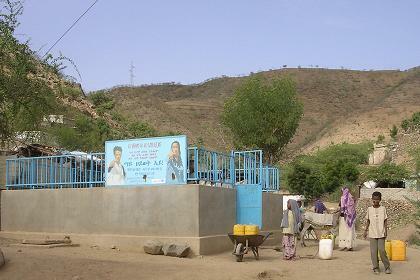 Water supply - Ghinda Eritrea. 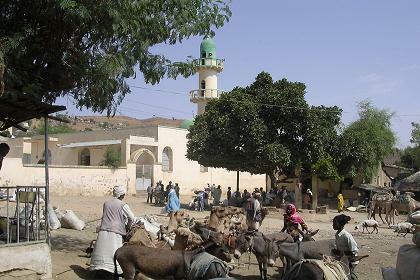 Street life - Ghinda Eritrea. 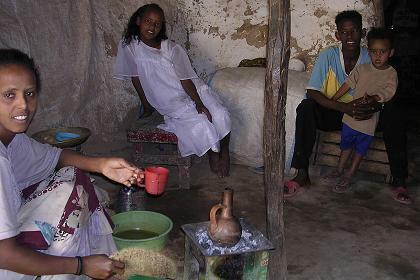 Coffee ceremony with an Eritrean family - Ghinda Eritrea. 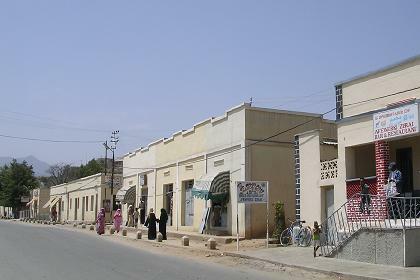 Main street - Ghinda Eritrea. 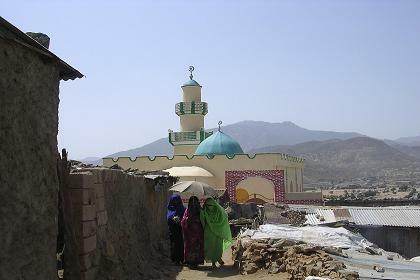 Uphill mosque - Ghinda Eritrea. 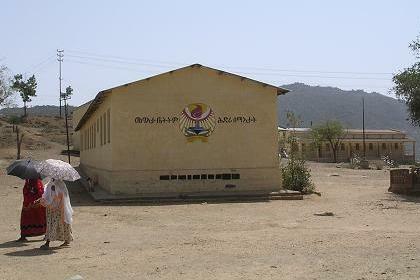 School buildings - Ghinda Eritrea. 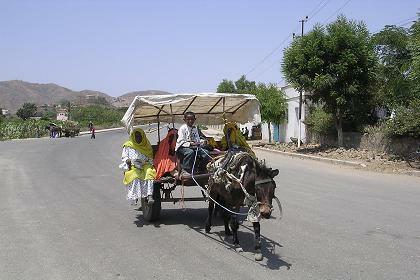 Local transport - Ghinda Eritrea. 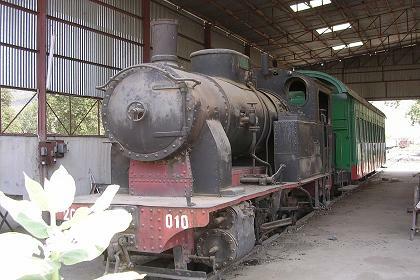 Steam shed - Railway station Ghinda Eritrea. 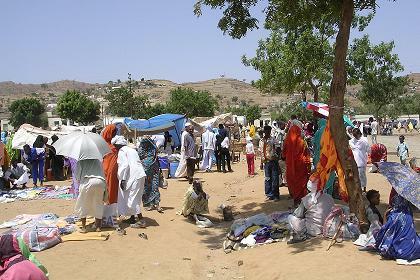 Local market - Ghinda Eritrea.